The extra strong timber we use makes a great framework to insulate and lay boarding on. Because we offer HiPex sheds or allow you to add extra height, walking around won't be a problem! If you order the type of shed (cladding/framework) you want, add as many windows, doors, partitions etc as you need then you can specific exactly where you want us to put those doors and windows. Obviously we will then come and fit it for you (included in the price). 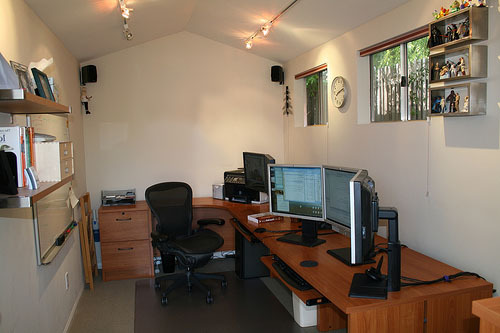 << This is an example of what your finished office shed could look like. Please note: we currently don't insulate or board out the interior, nor do we deal with any electrical aspects.